I went over to Sally’s last Sunday, exactly a week ago, and I bought this kit. I knew what I was going to get before I got there, which was this kit, a 240/400 grit Beauty Secrets nail file, and hopefully some extra silk fabric cut wraps. At Sally’s, it took a while to find everything. I avoid Sally’s as I have had a lot of money of mine empty from my wallet there, so it’s been a year or more since I shopped. There were WAY too many things there since the bubble of nail craze has gotten larger and larger, and people are buying UV gel nail polish, so it took forever to find the one small box on these large massively marketed shelving units. Looking it over, I was pretty happy with the kit iself, but Sally’s had no wraps to buy separately (and I should have gotten another special buffer, more on that later). I am going to recommend you get this if you try it so you don’t make the mistake I made. Do not forget to buy an ASP yellow buffer, which is I believe 320 fine grit buffer. (All Seasons Professional ASP Fine Grit Yellow Finishing Block, Ultra-fine 320 grit finishing block, Sally Item # SBS-203014, similar to white block but a finer grit). The yellow buffer thingy is mentioned in the instructions on step 2. Also, please grab yourself a ASP Miracle Buff and Shine block, which is mentioned on step 11. That block has a 400 grit side and a 200 grit side. If all those numbers are meaningless to you, just imagine you make my mistake and start hacking off your nail on accident with a file when you should be buffing it lightly. There was another wonderful video I will try to locate. I don’t have the url for it as I think I was on my android half snoozing watching TV when I saw it, but it was a great tech out of California who posted it and I thought she did a terrfic job. Her name was Elena or something like that maybe? I can’t remember, but anyway. Back to my problem: I have the worst, crummy nails! I hate their texture but I kind of like how light and thin they are sometimes because they grow quickly and feel good when I have an itch I gotta scratch. But they peel and shred at the tip and are ridgy. Sometimes, they are so shredded and frayed, I feel like Edward Paintbrushhands (if you can recall those horrible paintbrushes you would get in your Paint With Water sets as a kid! Just scratchy and not at all fun to paint with). Day 7 of ASP Wrap Kit Silk Nail wraps. Some chipping as with normal nail polish has occurred over the course of the week, so a coat of OPI Rainbow Connection was added to mitigate some of the wear. It’s still bad but nowhere near what they normally are, which are anywhere from 3 to 6 nails totally ragged and shredded at the tip in a combination of peeling, dented (like a microscopic dent), or a weird pushed-in flap that just snaps out and leaves a concave dish-shaped chip, or a torn corner sometimes. I’ll never be able to grow out any length at all this way. And with the amount of hand washing I do with the cleaning and cooking and working with grimy little kiddos all day, well they don’t even stand a chance. So at home, I read over the packet instructions, and they’re simple. Of course I played a little with the teeny bottles in the kit and I was excited to try it out. I won’t use fake tips though, way too high maintenance for me. The directions have two optional steps to follow if you use tips. The instructions are numbered 1 through 11. I particularly admired the verbiage on step 9: “Think of the mesh as an island and the nail surface as the ocean. You must see water all around the island.” You absolutely want 100% of the silk to be on the glue on your nail, but the glue is never to come any closer than a 1/32 of an inch (maybe 1 millimeter) margin around your entire nail. You do not want any silk flapping about the sides and bottom of your nail plate. Also step 9 imparted some other wisdom which I totally agree with: you need to smooth down the silk over the glue by pressing firmly and rubbing very firmly to build a very close and strong bond to the glue. The recommendation here is waxed paper. I used a 4″x4″ square and I recommend using a few or having a few on hand. Second, I had some trouble understanding what to do with the fringe of silk which had been cut and was hanging over the edge of my nails in a glued, crispy state. I think I should have considered that the “finish by buffing with the Miracle Buff and Shine block” step but it was unclear what was meant to apply the buffing block to. Was that the finish on the nail plate or the edges of hard, crispy glue coating? The confusion led me to use the 240 grit file I had bought to file the edges of my nail to remove the gluey silk, rather than maybe buffing. I learned that I should have tried a buffer instead, because what happened was that I ended up filing off a bunch of the edges of my nails and they got warped and shorter where the glue had stuck on most. So my cute prepped squoval nails were now warped and melted looking, and because I don’t really do ovals because of my fraying, I was pretty irritated at the awful shaping result from the lack of clarity in the directions. Ok so that night, I felt like the shaping of the nail tips weren’t the best, but I felt that, ultimately, the nail would last through another week of abuse. If so, then the nails under the wraps could maybe survive to not have to be cut down and maybe to grow out out a tiny bit. 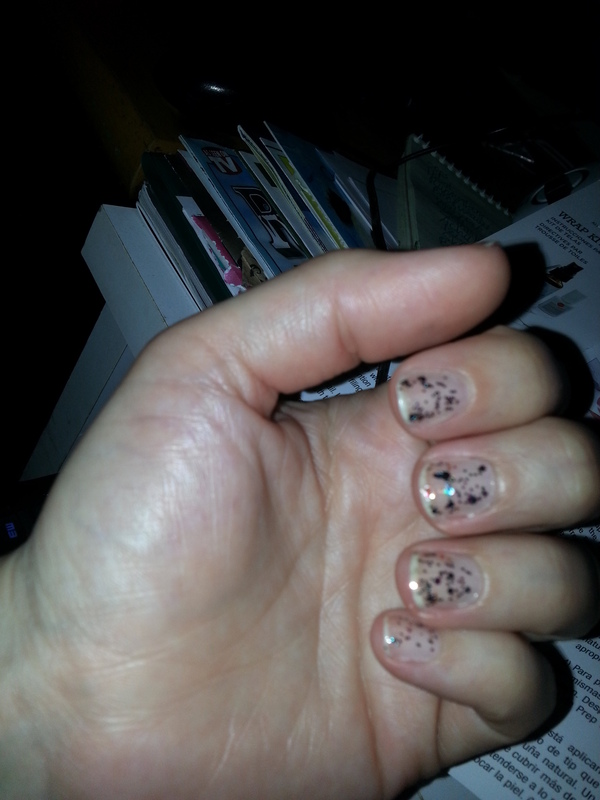 This week, I will probably redo them and remove the wraps with acetone and take a post picture au naturel. I do really love having the wraps on. I thought most of them lasted the entire week, though some did peel back and chip where it could be I didn’t get enough glue or contact made with the waxed paper, and the shaping on some was poor since I took a 240 file to the nail.